After 3 years of blogging I just crossed my 200th post and to thank everyone for the support and encouragement. Who can say no to an Oreo Cookie? 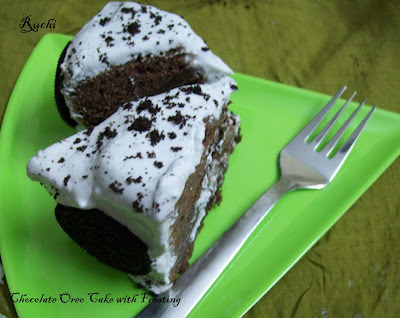 I loved the Oreos in the chocolate cake bake because they would go wonderfully well with fresh cream cakes! 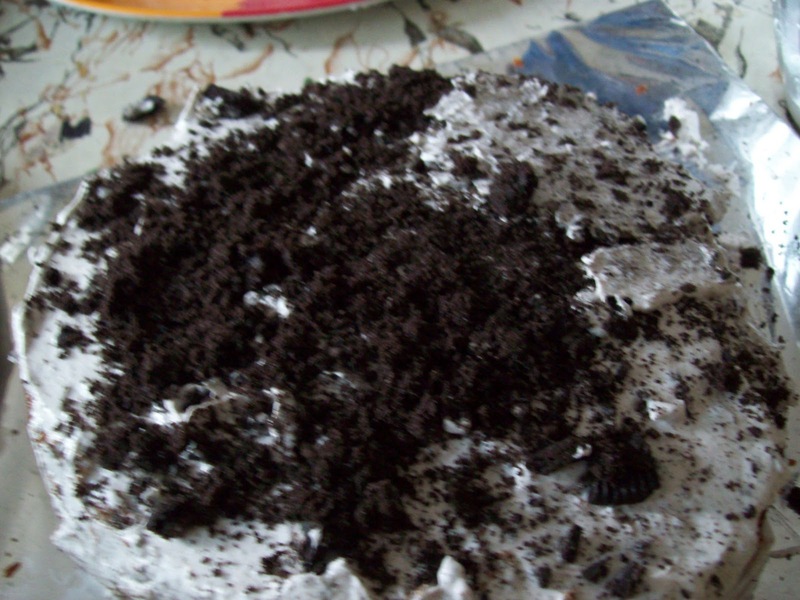 The cake is very easy to make and looks gorgeous!So I wanted to incorporate Oreos in the cake.SoI just make Oreo-filled chocolate cake, layer it with fresh whipped cream, dust it with crumbled Oreo. , It was all Yum. Moist, decadent, so delicious, but all of it at once was…well…completely and totally overwhelming. 2. Pour condensed milk in a bowl. Add the butter, and beat well till smooth. Add the flour spoon by spoon, mixing into the condensed milk mixture. 3. In between, add milk as required if the butter begins to get too stiff. Stir the mixture in one direction only all the while. This will incorporate more air and make the cake lighter. 4. Once all the flour is used up, beat the batter as above till light (5-7 minutes) mix gently till smooth. 5. 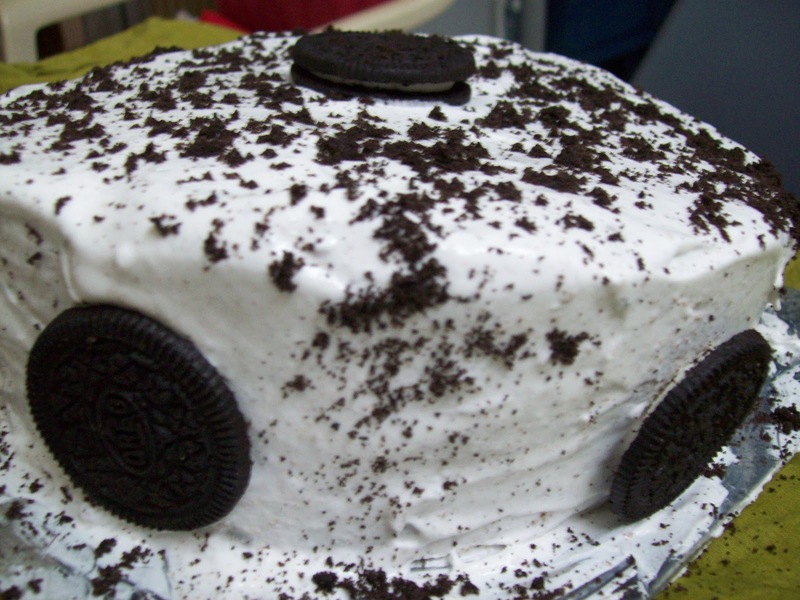 Pour into a greased cake tin. Do not smooth with a spoon etc. If the consistency is right this will not be needed. 6. Pre-heat over to 180o c. Place tin inside. Bake at 15-2o minutes or till done. Procedure:- Boil the water and add sugar and coffee. Cool this mixture completely . Once the cake is cooled completely, slice the cake into layers. Beat whipping cream on medium speed for about five minutes, until soft peaks form and add sugar. 1. Place the top most layer on the cake board and drizzle the sugar syrup using a spoon. 2.Make sure to drizzle is across evenly on the cake especially along the edges which tends to get a little hard. 3. Now add a generous dollop of fresh cream and spread it evenly using a spatula. 4..Now sprinkle about 1/4th of the crushed oreo cookies and chocolate chips. 5. Carefully place the second layer of the cake on top of the first and repeat the above steps of drizzling sugar syrup and fresh cream. 6. Place the last layer on top and again drizzle the remaining of the sugar syrup. 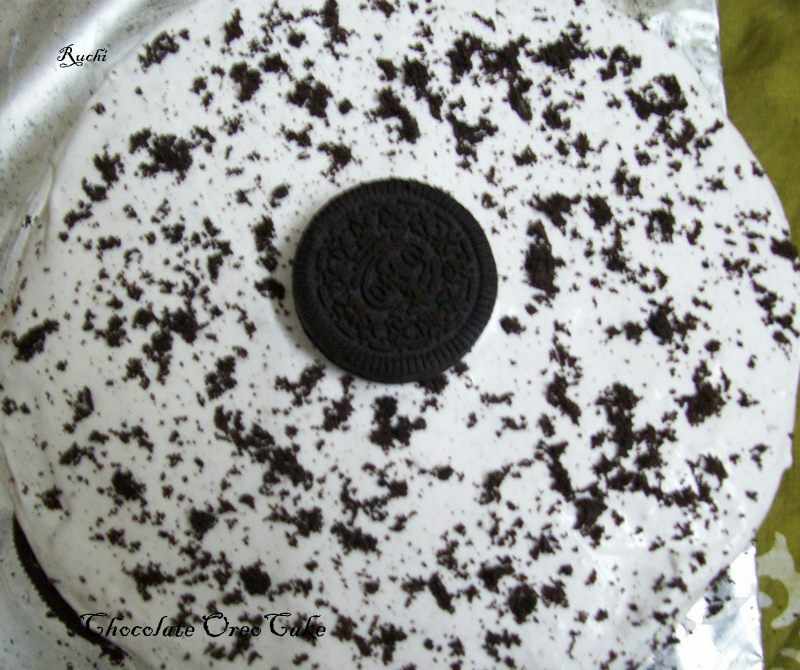 7.Now cover the sides of the cake and top with the remaining fresh cream, if the sides of the cake are not turning out evenly don't worry they will be coated with generous amount of crushed oreo's . 8.Top the cake with Whipped Cream and the whole Oreo cookies. Refrigerate for 1 hour to firm up then remove and allow coming to room temperature before serving. Sounds fabulous! Nice recipe ! Congrats Akka, keep on going..Cake looks absolutely tremendous and highly irresistible. wish you many more years of happy blogging akka. that sure is a rich cake! Thanks Jaishree to link this to my event - http://h4hemh4help.blogspot.com/2011/10/christmasnewyeareve2011.html. the sugar syrup to drizzle is the sugar solution that you made? the coffee one? if not, then where is the coffee solution to be used?